An educational family game based on the gameplay of the Ticket to Ride series. Ready for a new journey? The official adaptation of Ticket to Ride: First Journey is available on mobile, tablet and computer! 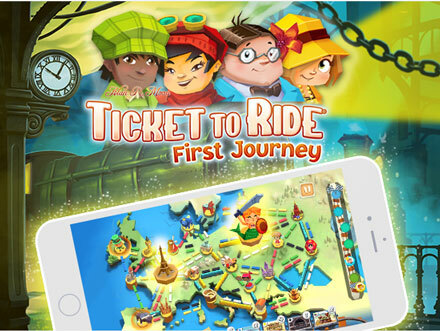 Children are finally able to join the great Ticket to Ride adventure through the two actual maps: Europe and USA! Enjoy a fantastic journey with this very simple and family-friendly app. Collect train cards, claim routes on the map and do your best to connect the cities shown on the tickets. On your turn, draw two trains cards from the deck or discard train cards of matching color to claim a route between two cities. Have fun through original illustrations and funny animations once you connect the cities. Learn more about the different cities and their iconic monuments. Share this adventure until 4 players on the same device thanks to the Pass-and-Play mode. If you want to play in solo, you can just play versus the AI. Connect the cities to get your 6 tickets and a reward! Try your best to complete the most routes you can to win the game, it takes a bit of risk but is so much fun! The winner also receives a golden ticket with a reward picture he can add to his collection. So, ready to hop on the ride? Learn more about the app in our YouTube trailer. This entry was posted on Friday, September 29th, 2017 at 19:08 and is filed under Asmodee Digital. You can follow any responses to this entry through the RSS 2.0 feed. Both comments and pings are currently closed.